New Zealand have put more pressure on Bangladesh in the first Test of three-match series in Hamilton as the Tigers are trailing by 307 runs at the end of the day 3 with six wickets in hand. After the centuries of Jeet Raval and Tom Latham, the Kiwi captain Kane Williamson struck a double-century to put a huge total of 715/6 in the first innings for New Zealand- the second highest total for any team in Tests against the Tigers. Sri Lanka struck the highest total against Bangladesh- 730 back in 2014 in Dhaka. New Zealand have declared the innings ensuring a massive first-innings lead of 481 runs. Bangladesh; however, started the second innings on a positive note as Tamim Iqbal and Shadman Islam added 88 runs in the openings stand. But they ended the day 3 on 174 for four wickets. Shadman fell as the first man scoring 37. He was hunted by Neil Wagner who took five wickets in the first innings. Wagner kept bowling at the short length relentlessly as he did in the first innings as well, and Shadman trapped while going for a pull. Trent Bould took a brilliant catch to remove the left-hander. Tamim, who struck a rapid ton in the opening innings of the match, fell prey to Tim Southee in the second innings for 74. Tamim also fell prey to a short ball from Tim Southee. The batsman went to leave the ball but at the very last moment, he managed an edge. Wicketkeeper BJ Watling took a regulation catch to discharge Tamim. Followed by the dismissals of Shadman and Tamim, MominulHaque and Mohammad Mithun disappointed as they fell for 8 and 0 respectively. Both of the batsmen were removed by Trent Boult. Bangladesh finished the day at 174 for four wickets in 43 overs. 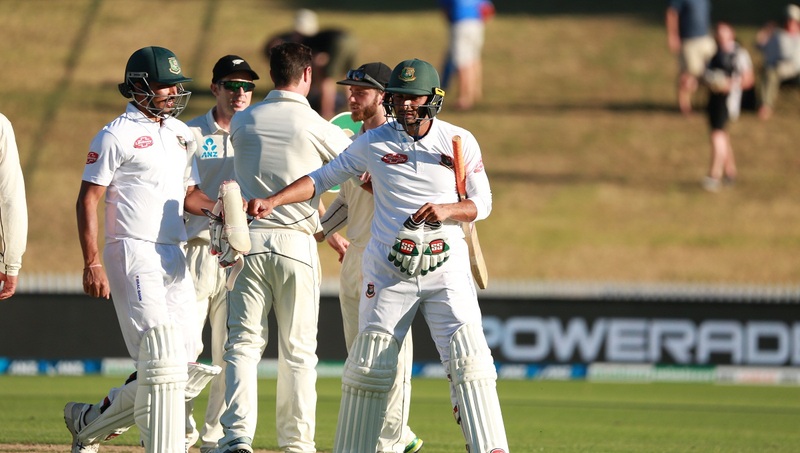 Soumya Sarkar and Mahmudullah Riyad are the unbeaten batsmen at the end of day 3. While Soumya scored 39, Mahmdullah added 15. Earlier, New Zealand ended their first innings after Willamson has completed second double-ton of his Test career (200*). The hosts started the third morning with 451 runs for four wickets on the board. The added more 264 runs in the third day before declaring the innings. Soumya and Mehidy scalped two wickets each for the Tigers while Mahmudullah Riyad and the debutant Ebadat Hossain bagged one wicket each. In the first innings of the match, Bangladesh have tumbled for 234 as Wagner registered a five-wicket haul for the hosts. Most of the Bangladesh batsmen were dismissed by short deliveries in the first innings. Bangladesh are playing the first Test of the series without their two regular campaigners Shakib Al Hasan and Mushfiqur Rahim. Shakib has been suffering from a finger injury that he has sustained in the final of Bangladesh Premier League on February 8 while Mushfiuqr has some issues with his rip. Mushfiqur is expected to return to the action in the second game in Wellington while Shakib might return in the third match in Christchurch.